Inspiration is where you find it, and often comes when you least expect it. I’m not sure how the mixologists at VaporFi came up with one of their latest ejuice flavors, Very Berry Slushie, but here’s one theory. A VaporFi employee is on a family road trip and stops for gas. The kids run into the convenience store and start filling a huge cup with a variety of Slushie flavors. Dad shakes his head in mock horror and then tries a sip. Instant inspiration. Very Berry Slushie opens with just a little tang of raspberries and the slightly sweet note of blueberries. Underneath the berries is a mild, juicy watermelon note. On the exhale the cool mildly minty taste of what VaporFi describes as colada pulls the entire experience all together. The vapor of Very Berry Slushie is cool and smooth, very similar to the texture of an actual slushie. The throat hit is mild and the aroma, fresh, sweet and very berry. I’ve been vaping Very Berry Slushie for a couple of days, and it’s very refreshing, slightly sweet and cool. No one flavor note is overpowering, this is a finely blended ejuice that will satisfy fans of fruit ejuice, especially vapers partial to berry flavored vapes. VaporFi offers Very Berry Slushie in 30 ml and 60 ml bottles for $17.99 and $32.99. 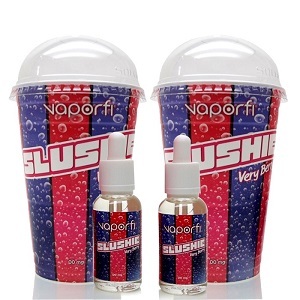 You can choose a nicotine level of 0 MG, 3 MG, 6 MG or 12 MG. VaporFi mixes Very Berry Slushie in a max VG blend. I vaped Very Berry Slushie in a SMOK TFV8 on a VaporFi VEX 150 TC. VaporFi provided the bottle of Very Berry Slushie I sampled for the purpose of this review, and VaporFi is a Seven Report advertiser. Order Very Berry Slushie from VaporFi.